My mother country, Japan does not always conform to the stereotypical view of the Westerner. Of course, the restaurants “manned” by robots, the futuristic neon, the throngs of office workers and peculiar fashion trends do exist however another world is waiting to be discovered by the intrepid traveller. If you dig a little deeper into a place that can tempt and delight at the same time you will be amazed at what you will experience, and this is even more the case when one heads outside of Japan’s sprawling capital city, Tokyo. You can go to extremes, from the snow monkeys which indulge in precipitous hot spring onsen baths high in the Japanese Alps to the tiny subtropical Okinawan islands with glorious and seemingly endless white sandy beaches in the south. From the monasteries on sacred Mount Koya serving exquisite Buddhist cuisine to the contemporary art ventures dispersed across the little fishing island of Naoshima. Suffice to say, perhaps one of the primary tests confronting many novice visitors to Japan is knowing where to begin and how much to try to condense into a single journey. The time of year when you go is also an important consideration. Japan, unlike many other parts of the world, enjoys four very distinct seasons (I wrote about Spring and the “cherry-blossom” season in a recent post) and these not only affect the weather, obviously but also what is served up to eat. It should also be noted that there is an enormous range of climates in Japan; from the snow and ice in the Skiers paradise at northernmost Hokkaido island to the sunny southern sub-tropical Okinawa. Following are my top 10 exciting ways to see Japan for the first-time visitor. At the northern tip of Japan’s main island of Honshu lies Tohoku. Sadly this area took the brunt of the 2011 earthquake and subsequent Tsunami. Most places are recovering well, and a lot of the area was ultimately unaffected, but it is still often overlooked by the traveller. There are rural mountainous regions, charming coastal villages and dense forests. Be sure to partake in a boat ride in Matsushima Bay and pay a visit to the tsunami-hit temple of Ishinomaki. You may also enjoy a taiko drumming lesson on the famous island of Sado! The lover of culture has a wealth of possibilities at their fingertips in Japan. Castles, gardens, ancient temples and meticulously maintained memorials. You may want to explore the old capital of Kyoto, the famous Kenrokuen garden in Kanazawa or maybe the historic site of Hiroshima or Miyajima island. The Japanese rail system has a well-deserved reputation for being clean, safe, punctual and quick. You can criss-cross the main Honshu island on a selection of trains visiting an assortment of beautiful attractions – from Kyoto and Osaka to Hiroshima and Takayama city. There is a magnificent view of Mount Fuji seen through the right-hand side window of the famous bullet train while heading out of Tokyo. You could even take a fantastic trip to mountainous Hakone (where I hail from!) on board the iconic Romance Car train. For the heat averse Japan offers many treats. Starting with the snow sculptures in Sapporo city on northernmost Hokkaido island to the snow monkeys mentioned earlier, bathing in their hot spring baths in small mountain towns. You could also take a ride on an ice-breaker ship among the moving floes of the Okhotsk Sea! Or perhaps you might want to explore the wasabi farms, and sake breweries and rest overnight in a traditional ryokan inn. From the delightful lanes of Kyoto, lined with temples and the ancient tea district of Kanazawa to the isolated coastal roads of the Noto Peninsula, why not do some exploring on two wheels Discovering nature spots as well as urban highpoints. When the muscles start to ache you can soothe them and relax in the hot spring baths in Wakura Onsen. Japan is a paradise for lovers of mountains, with an array of beautiful peaks spearing the clouds across the country. Start with the famous Mount Fuji, taking in the sunrise from its summit and then maybe Mount Yarigatake (the Japanese Matterhorn). 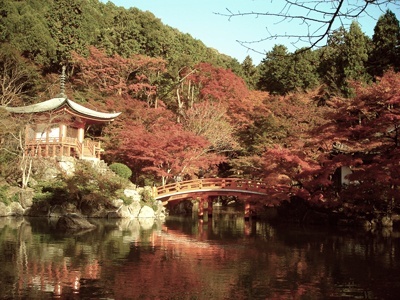 Then, when you want to come back down to Earth, you can explore Kyoto’s Zen gardens and temples at your leisure. Breathtaking. They say it is always better to arrive in Japan when your stomach is empty and with good reason! Did you know that Tokyo boasts the highest concentration of Michelin-starred restaurants in the world? But forget about gourmet, why not eat like a local? Soba, yakitori, ramen and sushi, you will be entirely spoilt for choice! You could even learn how to make soba (delicious noodles made from buckwheat) or visit Tokyo’s bustling fish market. Or maybe treat yourself to some delicious Buddhist cuisine in a remote mountain monastery! Get away from the hustle-bustle of urban Japan and discover the rural side on foot. There is a centuries-old highway called the Nakasendo that links the ancient capital of Kyoto with the new one of Tokyo. This trail was once congested with feudal lords, pilgrims and merchants and cuts through scenic forested mountains and rural villages with wooden architecture that will transport you back in time. You can stay in rustic inns with rest your tired limbs in a therapeutic hot spring onsen bath. If you have a substantial budget for your trip, you could arrange to stay in some of Japan’s top hotels and enjoy some pampering and the ultimate in luxury. You could start at the historic Imperial Hotel in Tokyo (where Her Majesty Queen Elizabeth II stayed during a state visit) or venture to the hot spring villages of Hakone and spend a night at the beautiful ryokan inn Gora Kadan. Maybe enjoy a welcome pitstop in Osaka and stay at the Ritz-Carlton and then explore the temples and bamboo forests of Kyoto and stay overnight at the beautiful Four Seasons hotel. Finally, we can forget about the skyscrapers and temples. For a taste of the Japanese-style island life, we can take a trip by plane to Okinawa – home to an archipelago of dispersed sub-tropical islands, with white sandy beaches, clean, clear waters, delicious fresh seafood and a wonderfully slow pace of life. You could take a trip out to the little island of Taketomi which is perfect for bicycle explorations with its immaculate beaches and traditional Okinawan architecture, as well as Iriomote with its dense tropical rainforests.